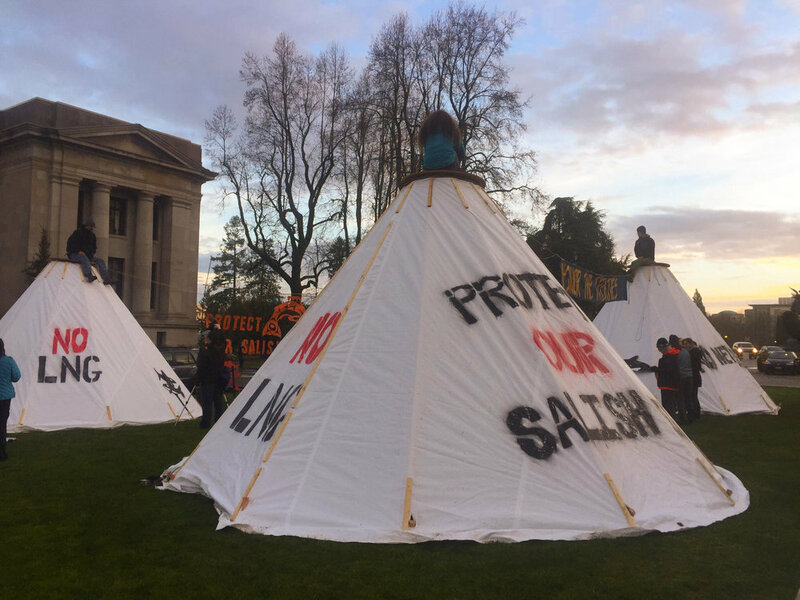 Seven Indigenous Women Occupy the lawn of the State Capitol — Seattle Cascadia Now! The event was kicked off by the erection of four tarpees (a style of tipi) on the lawn of the state Capitol and the song and prayers of local Indigenous leaders. With a call of no Liquid Natural Gas #NoLND253 Terminal in Tacoma, no oil pipelines, no coal trails, no fish farms. To kick off the legislative session local tribes and climate activists partnered up to make a strong statement for climate action during this 60 day legislative session. The Sacred Seven are currently on their 3rd day of occupation with the goal of 5 days. Three tarpees were taken down on the first day, day two they were given a eviction notice but one has continued to remain. They can use more support, if you're able and in the area please stop by. The more people there are the safer it is for the women not getting arrested. If unable to support in person, please spread the word! Over 300 people came to talk with their legislators speaking their concerns over environmental policy known thanks to the organizing of 350 Seattle. Older PostSeattle Acoustic Festival Line up!